2008-01-18 First worldwide family litigation filed litigation Critical https://patents.darts-ip.com/?family=7710794&utm_source=google_patent&utm_medium=platform_link&utm_campaign=public_patent_search&patent=WO2003055957(A1) "Global patent litigation dataset” by Darts-ip is licensed under a Creative Commons Attribution 4.0 International License. The invention relates to thermo-curable structural adhesives having multi-phase polymer morphology characterized in that the binding agent matrix of the cured reaction adhesive contains: (a) a continuous phase consisting of an optionally cross-linked polymer P1 having a glass transition temperature of higher than 100 °C, preferably higher than 120 °C; (b) a heterodisperse phase consisting of individual continuous areas of a thermoplastic or elastomeric polymer P2 having a glass transition temperature of lower than -30 °C and an average particle size ranging from 0.5 to 50 νm that, itself, contains separated phases of another thermoplastic or elastomeric polymer P3 having a glass transition temperature of lower than -30 °C and a size ranging from 1 νm to 100 νm, which can aggregated, in part, to from large agglomerates, and (c) an additional heterodisperse phase, which is embedded in the continuous phase and consists of areas of a thermoplastic or elastomeric polymer P3 having a glass transition temperature of lower than 30 °C that have, at least in part, an average particle size ranging from 1 νm to 50 νm, whereby P3 is not identical to P2. These multi-phase structural adhesives are suited for use a high-strength and shock-resistant structural adhesive in vehicle manufacturing, aircraft construction or railway vehicle manufacturing as well as for inner reinforcements of cavities in vehicle manufacturing and for producing reinforcing coatings for thin-walled metal sheets or plastic components. The present invention relates to reactive structural adhesives with multiphase polymer morphology, and their use in vehicle construction, aircraft construction or rail vehicle construction. In the machinery, vehicle or equipment, especially in Flugzeugbaμ, rail vehicle or motor vehicle components made of various metallic components and / or composite materials are "joined to an increasing extent with the aid of adhesives. For structural bonding with high demands on the strength are large peripheral thermosetting high strength reactive adhesives (structural adhesives) used, in particular as heat-curing one-component adhesives, which are frequently formulated as reactive hotmelts. reactive hot melt adhesives are adhesives which are solid at room temperature and to soften at about 80 ° to 90 ° C at temperatures and behave like a thermoplastic material. present in these hotmelt adhesives are thermally activated latent curing agent, so that irreversible curing to a thermoset occurs only at higher temperatures from about 100 ° C. for joining of the components, z. B. the vehicle industry, the adhesive is first applied hot to at least one substrate surface, which are then added components to be connected. On cooling, the adhesive then solidifies and through this physical solidification sufficient handling strength, ie a temporary connection. The thus interconnected components are further treated in various washing, phosphating and dip lacquer baths. Only then the adhesive is cured in an oven at elevated temperatures. Soft phase is limited by phase inversion or loss of mechanical strength. The influence of the soft phase domain size of the impact strength of two-phase polymers is low and not uniform. Although as epoxy polymers such Moφhologien in terms of their impact resistance at comparable tensile shear strength already represent a significant improvement over the homogeneous epoxy resin polymers, their behavior towards peel or impact peeling stress is still not sufficient. A modified polymer morphology was described by Buchholz and Mülhaupt; see eg. R. Mülhaupt, U. Buchholz in "Toughened Plastics II"; Adv. Chem. Ser. 252, American Chemical Society, Washington, DC, 1996, p 75 - 94. This was (butadiene-co- by dicyandiamide curing a mixture of an epoxy resin with a Liquid Rubber blend of a bisphenol-terminated polyether and a poly eopoxidterminierten acrylonitrile) generated. This results in a continuous matrix of an epoxy polymer resin having a glass transition temperature of 80 to 100 ° C, which contains the two-phase soft phase domains consisting of two different thermoplastic or elastomeric polymers with a low glass transition temperature and diameters greater than 1 micron. This polymer morphology has no further in the transmission electron microscope (TEM) visible discrete soft phase domains. A portion of a thermoplastic polymer is, however, incorporated homogeneously in the epoxy resin matrix, resulting in a decrease in the glass transition of the matrix. This leads to a reduction in strength at high temperatures above 80 ° C. Also known from EP-A-0,343,676 melt adhesive compositions are known which are composed of a mixture of several epoxy resins, a phenolic resin, and a polyurethane-epoxy adduct. Contained therein polyurethane-epoxy adduct consists of a reaction product of several Polyalkylenglycolhomo- and copolymers containing primary and secondary OH groups, a diisocyanate and at least one epoxy resin. It is stated that this hot melt adhesive composition are improved over various commercial one-component melt adhesive compositions in their shear strength, peel strength and impact strength, made on the adhesive properties of the cured adhesive joint at low temperatures are-no details. The US-A-5,290,857 describes an epoxy resin containing an epoxy resin and a powdery core / shell polymer and a heat-activatable hardener for the epoxy resin. The powdered core / shell polymer is composed of a core containing a Äcrylat- or methacrylate polymer having a glass transition temperature of -30 ° C or lower and a shell containing containing an acrylate or methacrylate polymer, the crosslinking monomer units, and whose glass transition temperature is greater than or equal to 70 ° C wherein the weight ratio of the core to the shell in the range between 10: 4: 1 to. 1 It is stated that these compositions have excellent adhesive properties such as impact strength, tensile shear strength and T-peel strength and also have a good partial gellability. Information about the properties of bonds with these adhesives at low temperatures are not made. Analogously, the US-A-5,686,509 describes an adhesion enhancing composition for epoxy resins consisting of powder-form copolymer particles. ionic with networked a mono- or divalent metal cation. Here, the core of the core / shell polymer of a diene monomer and optionally crosslinking monomer units is composed, which has a glass transition less than or equal to -30 ° C. The Schalencopolymer has assembled a glass transition temperature of at least 70 ° C and is composed of acrylate or methacrylate monomer units and radically polymerizable unsaturated carboxylic acid units cash. The adhesive composition will be given to 100 parts of epoxy resin have 15 to 60 parts by weight of adhesion-copolymer powder and 3 to 30 parts by weight of a heat-activatable curing agent. These compositions are recommended for use as structural adhesives for automobile parts. Information on the low temperature properties of such bonds are not made. From EP-A-0308664 epoxy resin compositions are known that contain an epoxide adduct of a -carboxylgruppenhaltigen copolymers based on butadiene Acrylnrtril or similar butadiene copolymers and a reaction product of a soluble in epoxy resins or dispersible elastomeric prepolymer having terminal isocyanate groups with a polyphenol or aminophenol and subsequent reaction of this adduct with an epoxy resin. Furthermore, these compositions may contain one or more epoxy resins. Henceforth be to cure for these compositions aminofunctional hardeners, polyaminoamides, polyphenols, polycarboxylic acids and their anhydrides proposed or catalytic hardeners and optionally accelerators. It is stated that these compositions are suitable as adhesives which can have high strength, high glass transition temperature, high peel strength, high impact strength or high tear propagation resistance depending on the specific composition. Similarly, the EP-A-0353190 epoxy resin compositions containing describes an adduct of an epoxy resin and a carboxylated butadiene-acrylonitrile copolymer and a reaction product of a hydroxyl-, mercapto- or amino-terminated polyalkylene glycol with a phenol carboxylic acid with subsequent reaction of the phenolic group with a epoxy resin. EP-A-0 353 190 is to be found that these compositions are suitable for the preparation of adhesives, adhesive films, patches, sealing compounds, paints or matrix resins. EP-A-338985 describes modified epoxy resins containing a liquid copolymer based on butadiene, a polar, ethylenisςh unsaturated comonomers and optionally other ethylenically unsaturated comonomers and also a reaction product of the dihydroxy terminated or diamino Polyälkylenglycolen and diisocyanates and a monophenol, a mercapto alcohol or an aliphatic lactam. According to this publication, these compositions can be used to improve the flexibility of epoxy resins. In addition to the aforementioned ingredients, these compositions should contain epoxy resins and a curing agent or accelerator. Such mixtures are to be used as adhesives, adhesive films, patches, matrix resins, lacquers or sealing compounds. EP-A-366157 describes epoxy resins containing polyesters based on polyalkylene glycol, and at higher temperatures effective hardener. These compositions contain at least one compound having at least one 1, 2-epoxide group in the molecule and a reaction product of an aliphatic or cycloaliphatic diol and an aromatic hydroxycarboxylic acid, as well as "a at higher temperatures curing agent effective for the epoxy-containing compound. It is stated that the cured an epoxy resin mixture should have a very good low temperature flexibility and corrosion resistance. About their suitability as adhesives with high peel strength at low temperatures, particularly at, impact load, no statement is made. EP-A-272222 describes epoxy resins containing polyesters based on polyalkylene glycol. In this case, these polyesters of aliphatic, cycloaliphatic or aromatic carboxylic acids and / or aromatic hydroxycarboxylic acids and aliphatic or cycloaliphatic diols% of the carboxylic acid derivatives derived from, wherein at least 70 wt. Derived from dimer and / or trimer fatty acids. It is stated that such epoxy resin compositions are suitable for the provision of heat-curable adhesives for the bonding of steel and aluminum substrates. The cured epoxy resin mixtures are said to have good low-temperature flexibility and corrosion resistance. From EP-A-307 666 water-insoluble compounds are known, which are free from isocyanate groups in wesentlichen- and at least two free phenolic hydroxyl groups per molecule and which are obtainable by reacting a polyisocyanate prepolymer which is an adduct of a polyisocyanate to a prepolymeric polyhydroxyl or is Polysulfhydryl compound, or is derived from a prepolymeric polyether amine. This pre-polymeric polyisocyanate is reacted with at least-one phenol having two or three phenolic hydroxyl groups or an aminophenol having one or two phenolic hydroxyl groups. These compounds are then reacted with epoxy resins, and thermally activated curing agents added to be used as adhesives. Information on the low-temperature behavior, especially under impact stress can not be inferred herein. EP-A-381625 describes curable compositions containing an epoxy resin, a recurring at elevated temperature activatable hardener äüf a liquid copolymer ~ derBasis of butadiene, "Acrylriitril and ^ gf. Further ethylenically unsaturated comonomers as well as a segmentiert.es copolymer consisting essentially of soft segments with polypropylene glycol or Polybutylenglycoleinheiten and selected hard segments having a softening temperature above 25 ° C. According to the teaching of this document are aromatic, the segmented copolymers of polyether diols based on polypropylene glycol, polytetramethylene glycol or amino-terminated polyether and saturated aliphatic dicarboxylic acids having 4 to 12 carbon atoms, or constructed dicarboxylic acids having 8 to 12 carbon atoms and may further short-chain diols or diamines in their hard segment enthalten..Gemäß the teaching of this document, these compositions are as adhesives, particularly as hot melt adhesives and as matrix resins, or as a surface coating agent. Strength, in particular peel strength under impact stress and a low temperature are not disclosed. According to the teaching of EP-A 0 354 498 and EP-A-0 591 307, reactive hotmelt adhesive compositions can be made of a resin component, to produce at least one thermally aktivierbärerT latent cures' for the resin component and optionally accelerators, fillers, thixotropic agents and further conventional additives, wherein the resin component solid epoxy resin and an epoxy resin liquid at room temperature with one or more linear or branched polyoxypropylene (s) -with-amino-end groups obtainable by the reaction of one at room temperature. Here, to the epoxy resins in such an amount, based on the amino-terminated polyoxypropylene, are used, that an excess of epoxy groups is ensured, based on the amino groups. These adhesive compositions already have a high peel strength in the peel test, which is retained even at low temperatures. The DE-A-19845607 describes condensation products of Carbonsäuredianhydriden, di- or polyamines, in particular polyphenols and Polyoxyalkylenamiden barren aminophenols and their Eigriüng ~ AELS synthesis component for epoxy resin compositions. Such structured compositions additionally contain rubber-modified epoxy resins as well as liquid and / or solid polyepoxides and conventional latent curing agents and accelerators and optionally fillers. They are suitable as impact-resistant, impact peel-resistant and peel-resistant adhesives in vehicle construction. Although these adhesive compositions have been overall a very good range of properties even at low temperatures, there remains a need for new and improved adhesive compositions for these application areas. PCT / EP01 / 03699 describes the condensation products of cyclic carboxylic acid anhydrides of dicarboxylic acids, tricarboxylic or tetracarboxylic acid anhydrides and difunctional polyamines, especially poly-oxyalkylene amines which are suitable as structural components for epoxy resin compositions. The Kondendationsprodukte based on tricarboxylic or tetracarboxylic to be distinguished by an average of more than one imide group and carboxyl group per molecule. Possibly. can then tri- or condensation products of tri- or more functional polyols and / or polyfunctional or be contained amino-terminated polymers and carboxylic anhydrides cycliscrTen in the compositions, the latter reaction products should contain on average more than one carboxyl group per molecule. Additionally, should these compositions, conventional rubber-modified epoxy resins and liquid and / or solid polyepoxide resins and conventional hardeners and accelerators and optionally fillers and rheology aids-included- According to the information-this is such compositions font are particularly suitable as impact-resistant, impact peel-resistant and peel-resistant adhesives jm vehicle and in electronics. In particular, at very low temperatures, these adhesives are very good impact peel exhibit properties. Structural adhesives with multiphase Polymermoφhologie are not described in the aforementioned prior art. The object of the / öf underlying invention, it is further developed to improve the "Moφhologie hardened reactive adhesives that they have sufficient flexibility and peel strength not only at room temperature but in particular also at low temperatures below 0 ° C. In particular, the peeling strength is at low temperatures and impact loading have the highest possible value so structurally bonded parts also in case of an accident (crash behavior) meet modern safety standards in vehicle construction. it is to the polymer morphology of these improvements without adversely affecting the peel strength, and in particular the tensile shear strength at high temperatures up to 120 ° C guarantee. The inventive solution of the problem is defined in the claims. It consists essentially in providing a heat-curable structural adhesive with multiphase Polymermoφhologie, wherein the binder matrix of the cured chemically reactive adhesive displays a continuous phase consisting of a, possibly cross-linked polymer (P1) having a glass transition temperature above 100 ° C, preferably 120 ° C, comprising in which a heterodisperse phase consisting of individual continuous domains of a thermoplastic or - dispersed elastomeric polymer P2 having a glass transition temperature of less than -30 ° C and an average particle size between 0.5 and 50 microns. 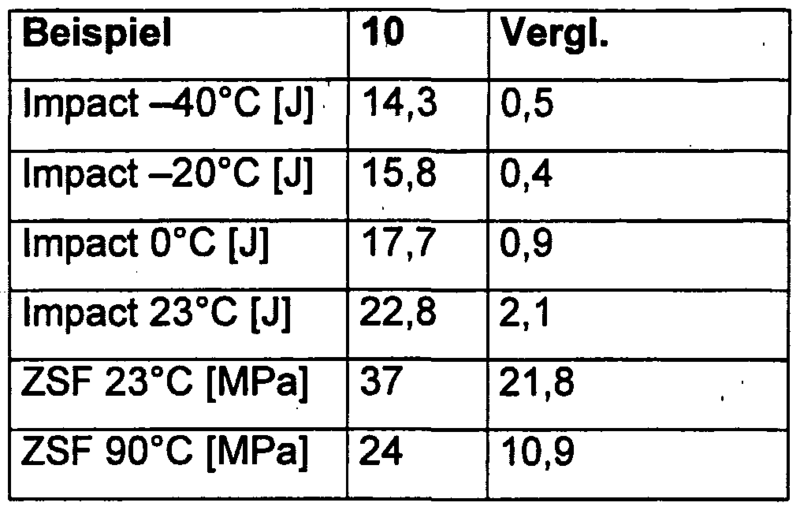 Within this phase, constituted by P2, another thermoplastic or elastomeric polymer P3 having einer_Glasübergangstemperatur-of less than -30 ° C is dispersed with average particle sizes between 1 nm and 100 nm, which may be partly aggregated to form larger agglomerates. Furthermore, in the continuous phase P1 another heterodisperse phase consisting of areas of the thermoplastic or elastomeric polymer P3 having a glass transition temperature of less than -30 ° C is dispersed at least partially have an average particle size between 1 nm and 50 nm, wherein P3 is not identical with P2. In a preferred embodiment, the continuous phase of the polymer P1 is formed by an epoxy resin, that on average more than one epoxy group per molecule identifies. The thermoplastic or elastomeric polymer P2 is preferably a reaction product produced from a difunctional amino-terminated polymer and a tri- or tetracarboxylic anhydride, wherein said reaction product has more than one imide group and carboxyl group per molecule. Preferably, this reaction product is then reacted with an excess of a liquid epoxy resin. Furthermore, the polymer P2 can be formed by a reaction product produced anhydride from a trifunctional or polyfunctional polyol or a trifunctional or polyfunctional .aminote.πninierten_Polymer and a cyclischen.Carbonsäure-, wherein the reaction product contains on average more than one carboxyl group per molecule contains. Also, this reaction product is preferably reacted with a large excess of a liquid epoxy resin. Furthermore, the polymer P2 can be formed by a mixture of the above two reaction products. . The thermoplastic or elastomeric polymers P3 is a copolymer based on butadiene, is a reaction product of a carboxyl group-containing copolymer based on butadiene acrylonitrile, butadiene (meth) acrylate, butadiene-acrylonitrile-styrene copolymer, butadiene (meth) - acrylate-styrene / copolymer or a dendrimer with a liquid epoxy resin. As epoxy resins for the-continuous-phase of the polymer-Pl. and for forming the epoxy adduct or for mixing or reacting with the thermoplastic polymer P2 and P3, a plurality of polyepoxides which have at least 2 1, 2-epoxy groups per molecule are suitable. The epoxy equivalent of these polyepoxides may vary from 150 to 4000. The polyepoxides can in principle be saturated, unsaturated, cyclic or acyclic, aliphatic, alicyclic, aromatic or heterocyclic polyepoxide compounds. Examples of suitable polyepoxides include the Polyglycidy an ether, prepared by reaction of epichlorohydrin or epibromohydrin with einem- Pölyphenol domestic presence of 'alkali. Polyphenols suitable for this are, for example, resorcinol, catechol, hydroquinone, bisphenol A (bis- (4-hydroxy-phenyl) -2,2-propane)), bisphenol F (bis (4-hydroxyphenyl) methane), bis (4-hydroxyphenyl) -1, 1-isobutane, 4,4'-Dihydroxybenzo- phenone, bis (4-hydroxyphenyl) -1, 1-ethane, 1,5-hydroxynaphthalene. Other polyepoxides suitable in principle are the polyglycidyl ethers of lyalkoholen Po or diamines. These polyglycidyl ethers are derived from polyalcohols, such as ethylene glycol, diethylene glycol, triethylene glycol, 1, 2-propylene glycol, 1, 4- butylene glycol, triethylene glycol, 1,5-pentanediol, 1, 6-hexanediol or trimethylolpropane. Other polyepoxides are polyglycidyl esters of polycarboxylic acids, for example reaction products of glycidol or epichlorohydrin with aliphatic or aromatic polycarboxylic acids such as oxalic acid, succinic acid, glutaric acid, terephthalic acid or dimer fatty acid. Other epoxides are derived from the epoxidation products of olefinically unsaturated cycloaliphatic compounds or from natural oils and fats. the epoxy resins derived by reaction of bisphenol A or bisphenol F and epichlorohydrin (DGEBA or DGEBF) are very particularly preferably derived. As a rule, mixtures of liquid and solid epoxy resins are used, the liquid epoxy resins preferably are-A on the basis of the bisphenol and have a sufficiently low molecular weight. In particular, for the adduct formation with the components P2 and P3 liquid epoxy resins at room temperature are used, which have an epoxy equivalent weight of 150 to about 220 in general, particularly preferred is an epoxy equivalent weight range 182-192. If the aforementioned difunctional amino-terminated polymer reacted with aliphatic tricarboxylic anhydrides such as citric acid anhydride, 1,2,3 Propantπcarbonsäureanhydrid or aconitic, so arise imide structures having free carboxyl groups at the imidic ring. Examples of aromatic tri- or tetracarboxylic acid anhydrides to be used are 1, 2,3- or 1, 2,4-benzenetricarboxylic anhydride, Mellophansäure-, pyromellitic acid, 1,8: 4,5- and 2,3: 6,7- naphthalene tetracarboxylic acid, perylene dianhydride, Biphenyltetracarbonsäure-, -Diphenylethertetraearbonsäure-, diphenylmethane tetracarboxylic acid, 2,2-diphenylpropane, benzophenone tetracarboxylic acid dianhydride, diphenylsulfonetetracarboxylic acid dianhydride or mixtures thereof. For the reaction product P2 also trifunctional or polyfunctional amino-terminated polymers can be used, preferably tri- or tetracarboxylic acid anhydrides are used as the second component, so that cyclic imide structures. When using carboxylic anhydrides of dicarboxylic acids, the condensation reaction is to be routed so that open-chain amide structures are formed with free carboxyl group. Specific examples of carboxylic acid anhydrides are maleic acid, succinic acid, citric acid, 1,2,3-Propantricarbonsäure-, aconitic acid, phthalic, 1,2,3- or 1,2,4-benzenetricarboxylic anhydride, Mellophansäure-, pyromellitic, 1,8: 4,5 and 2,3: 6,7-naphthalene-tetracarboxylic acid, perylene dianhydride, Biphenyltetracarbonsäure-, Diphenylethertetracarbonsäure-, diphenylmethane tetracarboxylic acid, 2,2-diphenylpropane Benzolphenontetra- acid dianhydride, diphenylsulfonetetracarboxylic dianhydride or mixtures thereof. Examples of the copolymers of the structural component P3 are 1,3-diene polymers containing carboxyl groups and other polar ethylenically unsaturated comonomers. As the diene thereby butadiene, isoprene or chloroprene may be used is preferably butadiene. Examples of polar ethylenically unsaturated comonomers are acrylic acid, methacrylic acid, lower alkyl esters of acrylic or methacrylic acid, for example the methyl or ethyl esters, amides of acrylic or methacrylic acid, fumaric acid, itaconic acid, maleic acid or its lower alkyl esters or Halbester, or maleic or itaconic anhydride, vinyl acetate or Vinylester such as in particular acrylonitrile or methacrylonitrile. Most particularly preferred copolymers A) are carboxyl-terminated butadiene (CTBN), which are available in liquid form under the trade name Hycar from BF Goodrich. These have molecular weights - and- inter 2000- 5000 and-acrylonitrile contents of between 10% and 30%. Actual examples are Hycar CTBN 1300 X 8, 1300 X 13 or 1300 X 15 °. Further, also used in US-A-5,290,857 or from US-A-5,686,509 known core / shell polymers as a component P3. Can ~ The core monomers should have a glass transition temperature of less than or equal to -30 ° C, these monomers can be selected from the group of the above diene monomer or suitable acrylate or Methäcrylatmonomeren, if necessary, "the core polymer contain crosslinking monomer units in small quantities. The shell is composed of copolymers, which has a glass transition temperature of at least 60 ° C. the shell is preferably acrylamide from lower alkyl acrylate or methacrylate monomer units (methyl or ethyl esters) and polar monomers such as (meth) acrylonitrile, (meth) styrene or radically polymerizable unsaturated carboxylic acids or carboxylic acid anhydrides. A further possibility for the synthesis component P3 is the use of dendrimers, they are also referred to as dendritic polymers, cascade polymers or "starbursf polymers. They are known to be gradually built by linking two or more monomers to each previously bonded monomers so that with each step, the number of monomer end groups grows exponentially, creating a spherical Baumstuktur at the end. Such dendrimers, for example, may be prepared by Michael addition of methyl acrylate to ammonia or amines. Particularly preferred for the synthesis component B), however, the adducts of epoxy resins and the liquid CTBN rubbers mentioned above are. Guanidines, substituted guanidines, substituted ureas, melamine resins, guanamine derivatives, cyclic tertiary amines, aromatic amines and / or mixtures thereof may be used as thermally-activatable or latent hardeners for the epoxy resin binder system of components P1, P2 and P3. Dabei, the hardener - both stöchiometriseh - with- be involved in the curing reaction, but they can also be catalytically active. Examples of substituted guanidines are methylguanidine, dimethylguanidine, trimethylguanidine, tetramethylguanidine, methyl isobiguanidine, Dimethyliso- biguanidine, Tetramethylisobiguanidin, Hexamethylisobiguanidin, heptamethyl isobiguanidin and very particularly cyanoguanidine (dicyandiamide). Representatives of suitable guanamine derivatives be alkylated benzoguanamine resins, benzoguanamine resins or methoxymethylethoxymethylbenzoguanamine called. For the one-component, heat-curing hot-melt adhesives, the selection criterion is, of course, the low solubility of those substances at room temperature in the resin system, so that this solid, finely ground hardeners are preferred, especially dicyandiamide is suitable. For a good storage stability of the composition is ensured. In addition to or instead of the above-mentioned hardeners catalytically active substituted ureas may be used. These are in particular the p-chlorophenyl-N, N-dimethylurea (Monuron), 3-phenyl-1, 1-dimethylurea (Fenuron) or 3,4-Dichloφhenyl-N, N-dimethylurea (diuron). In principle, catalytically active tertiary aryl or alkyl amines, such as benzyldimethylamine, tris (dimethylamino) phenol, piperidine or piperidine derivatives are used, but these frequently have too high a solubility in the adhesive system, so that here no usable storage stability of the one-component system is achieved. Further, various, preferably solid imidazole derivatives are used as catalytically active accelerators. As representatives are 2-ethyl-2-methylimidazole, N-butylimidazole, benzimidazole and N-Ci to Ci 2 -Alkylimidazole or N-arylimidazoles. Usually "contain adhesives of the invention further fillers known per se such as the various ground or precipitated chalks, carbon black, calcium magnesium carbonates, barytes and in particular silicate fillers of the aluminum magnesium calcium silicate, eg. As wollastonite , chlorite. The adhesive compositions according to the invention may further common auxiliary substances and additives such. For example, plasticizers, reactive diluents, rheology aids, wetting agents, antioxidants, stabilizers and / or color pigments. Adhesive compositions these requirements surprisingly to a very high extent. The following examples illustrate the invention. In the compositions of this all amounts are by weight unless otherwise indicated. 3.1 mol of maleic anhydride was brought min to the reaction under nitrogen atmosphere and stirring with 1 mole of Jeffamine XTJ-509 (trivalent amino-terminated polypropylene oxide) at 120 ° C for 120th The reaction product is reacted with the 2,3 times the mass of a liquid DGEBA epoxy resin and 0.25 wt .-%-triphenylphosphine for 90 min at 100 ° C.
Under nitrogen atmosphere and with stirring 1300 X13 (carboxy-terminated poly (butadiene-co-acrylonitrile)) were measured at 140 ° C Hycar CTBN with an approximately 10-fold molar excess of a liquid DGEBA epoxy resin reacted for 3 hours until a constant of the reaction. The product with 40% butyl rubber has an epoxy equivalent weight of 900 and a viscosity of 200 Pa.s at 80 ° C.
The adhesive has after curing (30 min at 180 ° C) to the Moφhologie according to the invention as seen from the transmission electron microscopic (TEM) images can be seen. In the table, the adhesive properties of the inventive example and the adhesive properties of an adhesive of the prior art are compared. The adhesive of comparative example is Terokal 5051 Henkel Teroson. This adhesive comprises a two-phase Moφhologie mikroheterodispersen with a phase of an elastomeric polymer with a low glass transition temperature below -40 ° C in a continuous highly crosslinked epoxy resin matrix with a high glass transition above 120 ° C. There are in this case discrete spherical soft phase domains having diameters between 0.5 and 2 microns homogeneously distributed in the matrix before. Show the erfindüngsgemäße example "se rhöhe impact peel strength" "(lmpact) to ISO 11343 even at high impact velocities particular, this is due to high impact peel values at the low temperatures of -20 ° C and -.. Clear 40 ° C At the same time, these compositions have even at high temperatures of 90 ° C, a high tensile shear strength (TSS) according to DIN 53283 and are in two values, the compositions according to the prior art is far superior. 1.) The hot-curing structural adhesive in with multiphase Polymermoφhologie characterized in that the binder matrix of the cured chemically reactive adhesive displays a) a continuous phase consisting of an optionally cross-linked polymer P1 having a glass transition temperature above 100 ° C, preferably above 120 C C, b) a heterodisperse phase consisting of individual continuous domains of a thermoplastic or elastomeric polymer P2 having a glass transition temperature of less than -30 ° C and an average particle size of between-0 7 5 and 50 μm.-which in turn separate phases of another thermoplastic or elastomeric polymer P3 having a glass transition temperature contains less than -30 ° C and a size of between 1 nm and 100 nm, which may be partly aggregated to form larger agglomerates, and c) an embedded in the continuous phase further heterodisperse phase consisting of portions of a thermoplastic thermoplastic or elastomeric polymer P3 having a glass transition temperature of less than -30 ° C, which at least partially have an average particle size between 1 nm and 50 nm Tn wöbei P3 is not identical to P2 ,. 2.) The hot-curing adhesive as claimed in claim 1, characterized in that the continuous phase of the polymer P1 is formed by an epoxy resin having on average more than one epoxy group per molecule. 3.) The hot-curing adhesive as claimed in claim 1 or 2, characterized in that the polymer P2 a) a reaction product producible from a difunctional amino-terminated polymer and a tri- or tetracarboxylic acid anhydride characterized by on average more than one imide group and carboxyl group per molecule, or b ) is a reaction product produced (from a trifunctional or polyfunctional polyol or a trifunctional or polyfunctional amino-terminated polymer and a cyclic carboxylic anhydride, wherein the reaction product contains more than one carboxyl group per molecule, or c) a mixture of reaction products according to (a) and b), which is then reacted with an excess of an epoxy resin. 4.) The hot-curing adhesive as claimed in claim 1 or 2, that the polymer P3 is a copolymer based on butadiene. 5.) The hot-curing adhesive according to-claim characterized-Aγ that the copolymer is a carboxyl group-containing copolymer based on butadiene acrylonitrile, butadiene (meth) acrylate, a butadiene-acrylonitrile-styrene copolymer, butadiene (meth) acrylate -styrene copolymer or a dendrimer is. 6. Use of the compositions according to at least one of the preceding claims as a high-strength, impact resistant structural adhesive in vehicle construction, aircraft construction or rail vehicle construction. 8. The use of according to claim 6 for the manufacture of composite materials, as potting compounds in the electrical or electronics industry and as DIE attach adhesive in the production of printed circuit boards in the electronics industry. (D) curing the bond by heating the components to temperatures of between 80 ° C and 210 ° C, preferably between 120 ° C and 180 ° C.
BRPI0809752B1 (en) 2007-04-11 2017-05-16 Dow Global Technologies Inc "Structural adhesive component and a method"
ES2068911T3 (en) * 1988-07-28 1995-05-01 Ciba Geigy Ag Combinations of flexibilizers for epoxy resins. ES2090116T3 (en) * 1989-02-02 1996-10-16 Ciba Geigy Ag tenacious epoxy resins. ES2375498T3 (en) 2012-03-01 epoxy resins having improved impact resistance. ES2228147T3 (en) 2005-04-01 Epoxy resin compositions shockproof.